For four sweet, sweet hours on the morning of Cinco de Mayo, Taco Bell will be giving away free Biscuit tacos. Now, the Biscuit taco and I may have a past fraught with tension, but even I recognize that the call of free Biscuit tacos (your choice of sausage or bacon) is too strong to resist. From 7 a.m. until 11 a.m. on Cinco de Mayo (May 5), whether you’re at the drive-thru or ordering at the counter (do people still do that? ), that free Biscuit taco is yours. Incidentally, this type of food is the perfect way to start building a fortress in your stomach to protect it from the onslaught of Cinco de Mayo merriment that May or May (get it?) not come later in the day. Taco Bell announced the giveaway on Periscope, the hot new video live-streaming social media app. This seems to be part of the chain’s recent campaign to appear cooler than its traditional fast-food breakfast counterparts — Taco Bell is hip to the coolest technology, OK? Forget Facebook; Taco Bell knows what the kids are into these days. I think I just watched the most important @periscopeco stream of my life: @tacobell is giving out FREE Biscuit Tacos on Cinco de Mayo! It even has a weirdly intense new video about how its breakfast is the key to personal liberty or something. I mean, you’re still getting your breakfast from a huge, multinational corporation that grossed more than $13 billion in revenues in 2014, but I guess since there’s no “Mc” preceding Biscuit taco, that means you’re actually on the path to self-actualization every time you eat one. But I digress. We’re here to celebrate free breakfast, and I think we can all agree that a $0 Biscuit taco on Cinco de Mayo is good for everyone. Head to your local Taco Bell between 7 a.m. and 11 a.m. on the 5th to take advantage of this tasty breakfast offer. 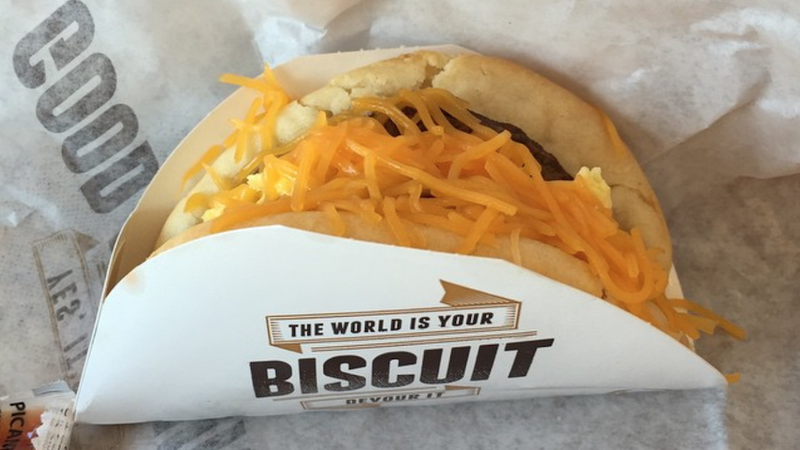 Even if the Biscuit taco isn’t actually a taco.